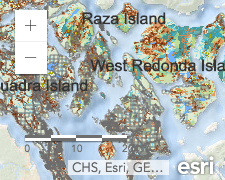 The watersheds analysis project created a database that can be used to create maps that display new and different information about the Discovery Islands, viewed in relation to the area’s natural watershed boundaries. The data collection exercise updated and added descriptive information to identify and measure natural features and human impacts. 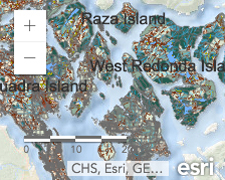 It can identify watershed integrity according to the location and percentage of intact areas. The assessment also modeled for highly productive landscapes and areas of high physical rarity that may warrant special management attention. 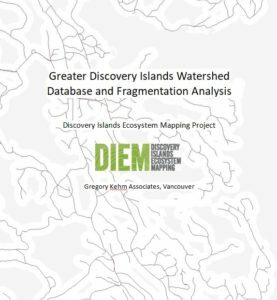 Read More: DIEM Watershed Analysis Report. The study area includes over 2,500 watersheds. The project “populated” every watershed with a (same) selected-set of ecological and human pressure attributes – which may be changed and updated as specific needs arise. 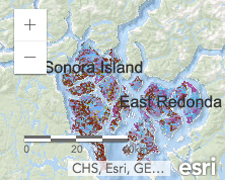 Ecological attributes data currently includes the sensitive ecosystem features, protected lands, and selected enduring features, elevations, and geological classes. Human pressures are primarily assessed according to linear fragmentation (i.e. roads) and forest harvest history. In this study, the integrity of a watershed is defined by its “intactness” expressed as the percentage of the watershed with no disturbance from human-caused fragmentation. Landscape areas with no disturbances have the highest integrity and are referred to as “intact landscapes.” Watersheds can be entirely intact or can contain one or more intact landscapes. 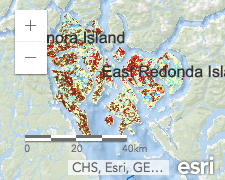 The goal of this project was to understand the condition of watersheds across the Discovery Islands and a portion of Bute Inlet’s mainland (see study area). In addition to identifying human impacts, the project data also documents a baseline that can be used to measure changes over time. DIEM Project thanks the TULA Foundation for funding to accomplish the Watersheds Analysis and maps production.